Identification: Females are much larger than males. Upperside of female forewing is mostly gray brown on the front half and dark brown on the rear half. Upperside of male forewing is yellow gray or gray brown. Both sexes have wavy dark markings. 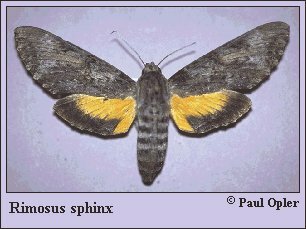 Upperside hindwing of both sexes is yellow with an incomplete dark border on the outer margin. Flight: . August in Arizona. Caterpillar Hosts: Frangipani (Plumeria species). Habitat: Subtropical and tropical environments. Range: Northern Brazil north through Central America, the West Indies, and Mexico to southern Arizona.